Every fall, Irrigation Tech makes an appointment at a convenient time for you to come to your home to winterize your lawn sprinkler system. Winterization includes shutting the system off and removing all of the water from every zone of your irrigation system. This is done with a very large compressor to ensure that all of the water is completely removed from the system. When nothing but air is exiting the sprinkler heads your sprinkler system is ready for the freezing winter temperatures. 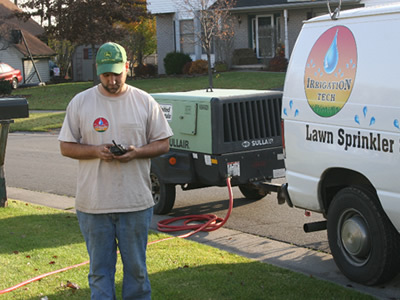 Irrigation Tech guarantees your system will not freeze, if we perform the winterization service.